Vaishaka Sukla paksha Tadiya or Tritiya is celebrated as Akshaya Tritiya. It is the third day of the waxing phase of the moon in the month of Vaishaka of the Lunar calendar. This year Akshaya tritiya falls on Tuesday, 22nd April 2042. Lord Vishnu is the ruler of Akshaya Tritiya. It is believed that any Daana, Tapa, Japa done on Akshaya Tritiya would yield Akshaya or infinite Punya or Virtue. Akshaya the name itself speak the one that can never diminish or end. 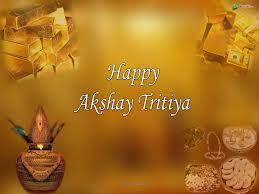 Buying of Gold is believed to be auspicious on Akshaya Tritiya. If one buys gold on Akshaya Tritiya then as per the name of the day gold is supposed to become infinite. Therefore it is believed that if one buys gold on Akshaya Tritiya, Gold will never diminish in his house and he would be wealthy and prosperous. Treta Yuga started on Akshaya Tritiya. If any new work is started on Akshaya Tritiya it is a guaranteed success. There are two other days where the success is guaranteed Ugadi and Dassera or Viajya Dasami.